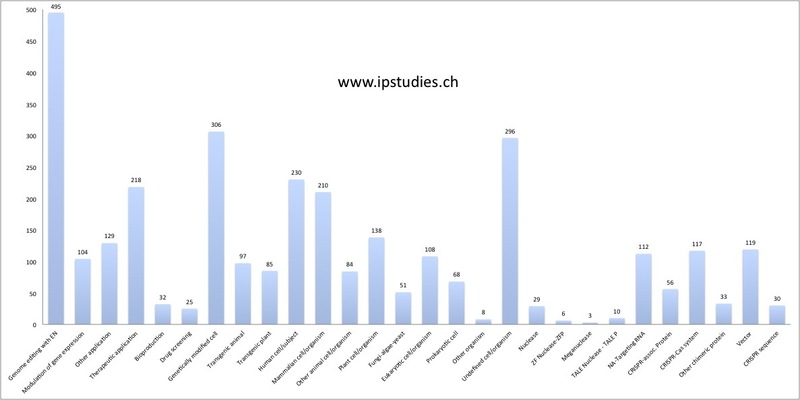 The IPStudies 2017 CRISPR patent landscape is out, don’t miss it! The CRISPR patent landscape keeps on developing at an increasing pace in 2017, with now up to three new patent families published every day! We have searched, reviewed and categorized more than 1146 patent families, now surveyed in our just released 2017 CRISPR patent landscape report. January 31, 2017 February 7, 2017 Corinne LE BUHANComments are off for this post. Will the CRISPR patent landscape soon move to a one-stop license shopping? The past 24 hours have brought new light and significant moves in the complex CRISPR patent landscape. First (that was in European time zone! ), our CRISPR expert Fabien Palazzoli celebrated the 1000th CRISPR patent family extraction out of the worldwide published patent databases. Our next monthly update will actually feature more than 1050 classified and categorized CRISPR patent families – more than 10 times the initial set of our first landscape release back in summer 2014! December 7, 2016 January 31, 2017 Corinne LE BUHANComments are off for this post. Corinne Le Buhan will be teaching IP management “From IP strategy to IP operations” at next IEEPI session in Paris this Friday, November 25. This professional training will help you learn about practical IP strategies and key IP management challenges from various business environments, how to define your own organisation IP strategy and how to implement it in practice with various IP development, enforcement and commercialisation tactics. In this one-day session, emphasis is put on practical management tools and checklists, illustrated with case studies from various industries, and a situational workshop experimentation. A couple of seats are available as last minute registration – don’t miss yours! November 21, 2016 Corinne LE BUHANComments are off for this post. The CRISPR patent landscape keeps on developing with in average a new patent publication every day. We have now searched, reviewed and categorized more than 920 patent families in our October 2016 CRISPR patent analytics data set. November 8, 2016 Corinne LE BUHANComments are off for this post. The CRISPR patent landscape keeps on developing with in average a new patent publication every day. We have now searched, reviewed and categorized more than 850 patent families in our CRISPR patent analytics database. October 3, 2016 October 4, 2016 Corinne LE BUHANComments are off for this post. Earlier this month, we were interviewed by The Scientist regarding the side inventorship dispute between Feng Zhang and Luciano Marraffini on some of the Broad patent applications. Public registers at the USPTO, WIPO and the EPO expose further details of the otherwise un-publicized legal battles for invention ownership between their employers (the Broad Institute of Harvard and MIT and Rockfeller University), back from the 2012-2013 early filings. From January to July 2016, our CRISPR patent monitoring set has almost doubled, from 489 to 787 published patent families. We now search, review and classify them on a monthly basis to stay up to date, watching for the latest technology coverage and application developments as can be derived from the individual patent claims. What does the new patent box tax regime mean for your IP (and R&D) strategy? R&D investment deduction incentives, for optimising R&D investments and thus encouraging innovation. For the first quarter of 2016, we have added another 105 patent families to our CRISPR patent monitoring set. The CRISPR patent landscape keeps on growing steadily, with on average one new CRISPR patent family publication every day. Our updated claim coverage analysis confirms the trends and facts we’ve reported in our detailed January 2016 patent landscape. Less licensing deals have been announced in the past few months, as the whole industry is watching for USPTO updates on the PTAB interference between two of the pioneering patent filings. More qualitative financial analysts are also now monitoring the outcome of this dispute, after the first successful CRISPR IPO (NASDAQ:EDIT) by Editas, a licensee of the pioneering Broad Institute patents, and the early April announcement of its own IPO filing by rival Intellia, a licensee of the pioneering University of California patent. In Europe, the CRISPR patent landscape is just as uncertain, with multiple (many anonymous – “strawman”) oppositions filed on the first granted patents. While the uncertainty surrounding the licensing of the core technology patents is getting most media and business attention currently, the next rounds are already taking shape behind this main scene, with near 600 silent patent families claiming their own exclusive share of technology improvements, design-around attempts, and a myriad of specific application developments. There will be further disputes, settlements, and maybe even patent pools in the CRISPR era. The whole data is there, in multiple patent offices and databases – at IPStudies, we search, retrieve, sort and classify this data set to facilitate the CRISPR technology and competition watch for our customers: for more information on our patent landscape and patent monitoring services, check our CRISPR patent analytics offering or send us your inquiry through our contact form.